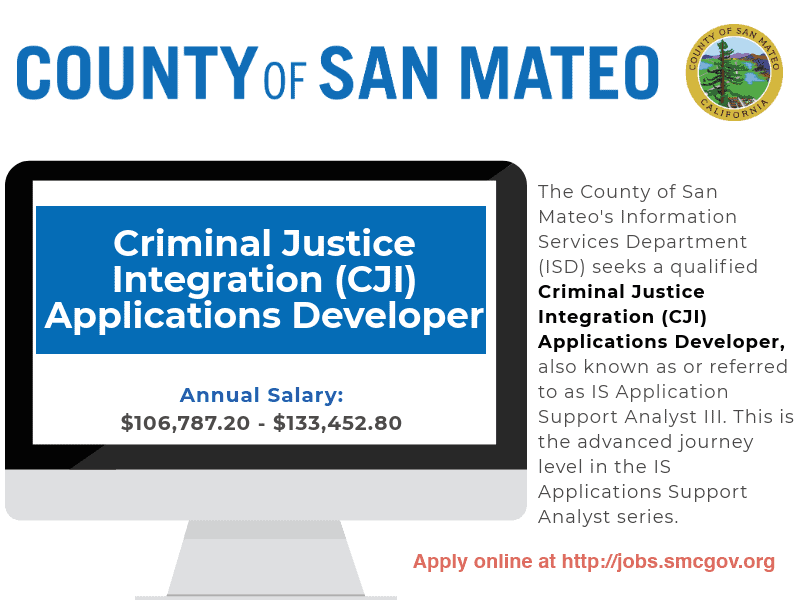 The Information Services Department of the County of San Mateo is seeking highly-qualified candidates for the position of CJI APPLICATIONS DEVELOPER. Applications are being accepted for the position of Information Systems Administrator with the City of South San Francisco. Application Deadline: OPEN UNTIL FILLED. Recruitment may close at any time once a sufficient number of qualified applications have been received. The City of South San Francisco is a fully independent and highly commercialized full-service City with an estimated population of 65,710 growing to 100,000 during business hours. City departments include: Police, Fire; Parks and Recreation, Public Works, Economic and Community Development, City Attorney, Library, Finance, Information Technology, Human Resources, City Clerk, and Office of the City Manager. The City has a Council-City Manager form of government with more than 400 full-and part-time employees. The Information Technology Department is composed of a Director, one Senior Systems Administrator, two System Administrators, two Services Technicians, and an Administrative Assistant II. The Department's mission is to design, implement, and maintain the Citywide information technology network; to set standards for all user hardware to assure system compatibility; to support user hardware and assist with the training of employees in the use of various common softwares; and to assist departments in planning for their particular unique technology needs. Under general supervision, plans, develops, coordinates, implements, and supports the activities and operations related to the City’s multi-user and server-based computer systems; installs and supports operating system and applications software; performs a variety of complex technical duties in the installation, repair, replacement, and maintenance of computer hardware and software; and performs other related duties as assigned. Manages and administers the City's multi-user and server-based computers, including installation and maintenance of operating systems and applications software. Implements goals, objectives, policies and priorities for assigned services and activities related to multi-user computers and servers, including security and system design. Serves as liaison with City wide staff and information technology staff to define technical and operational requirements. Administers and coordinate user access and control; installs, maintains, and deletes users; assigns user rights, according to established policy under the direction. Develops and administers disaster recovery procedures and backup systems. Experience: Three years of progressively more responsible demonstrated hands-on experience managing and administering multi-user and server-based computer systems. Training: A bachelor’s degree from an accredited college or university with major coursework in computer science or a related field; or the equivalent to a bachelor's degree, which may include specialized training, certifications or other relevant education or preparation. All licenses and certificates must be maintained as a condition of employment. Possession of, or ability to obtain, a valid, appropriate California driver’s license and a satisfactory driving record. The process will first consist of a review of application materials and responses to the supplemental questionnaire, which must be detailed and complete. A resume is REQUIRED, but does not substitute for a complete application. Applications with "see resume" as a substitution for the work experience description; those with unclear past employment information; or those with insufficient information to evaluate possession of minimum qualifications will not be considered. The most highly suitable and qualified candidates will be invited to participate in an oral panel interview. Upon completion of this examination, an eligible list will be established which will be used for the appointment to the position. Possession of the minimal qualifications does not guarantee advancement in the selection process and placement on the eligible employment list. Top scoring candidates will be invited to the next phase of the selection process which will consist of a departmental interview. Oral Panel Interview tentatively scheduled for the week of June 3 or June 10, 2019. Appeals concerning administration of an examination must be submitted in writing within two (2) business days from the date the event occurred. Note: The City of South San Francisco reserves the right, at its discretion, to limit the number of qualified candidates invited to the selection process.